The assembler and disassembler have been written using python3. 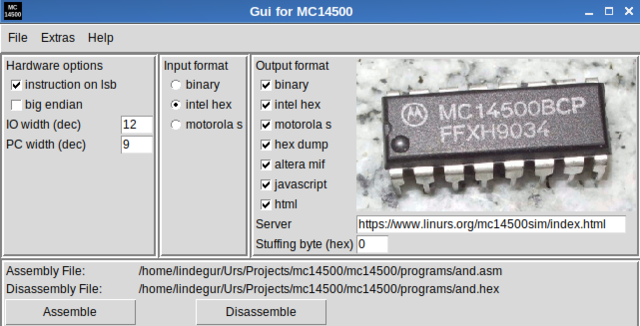 mc14500.py --help or mc14500.py -h will show all the command line options for the assembler. mc14500dis.py --help or mc14500dis.py -h will show all the command line options for the disassembler. The following options need to be adjusted to the hardware implementation. ilsb defines where the 4bit MC14500 instruction is located in the command. bigendian defines that the program memory uses big endian. Default is little endian. This is important if more than one address is required for a command. The ORG command has been implemented for backward reasons. It allows to set the program counter and have instruction placed on defined locations in the program memory. Since almost every MC14500 design can not jump over memory addresses it makes no sense to use it and it has the potential danger that the program memory can overlap and undefined holes are created. Depending on the output format certain checks are performed that can create warnings and errors.